Dark skin Colour is a common problem of both males and females. 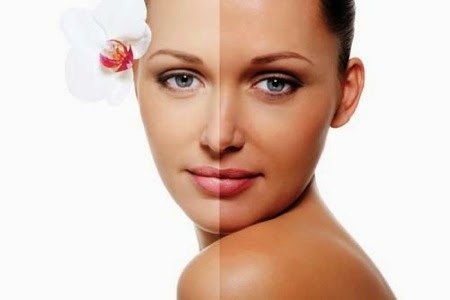 People living in hot tropical regions of earth often suffer from this problem because in hot environment our skin cells produce more melanin pigment to protect skin from harmful effects of UV Sun rays.Except ecological habitation there are some others reasons which cause darkened skin even may convert your fair skin into dark or brownish black. Our skin contains melanin pigment which is produced by cells called melanocytes in a process called melanogenesis.The quantity of Melanin pigment is responsible to give your skin a variety of different colours ranging from white to dark brownish black.Melanin is triggered by an enzyme called tyrosinase which creates the color of skin, eyes, and hair shades.Sometimes excessive production of melanin pigment give your skin a dark complexion. Some inherited factors are also responsible to give you a dark complexion even by Birth.Skin colour is also controlled by variety of paired genes and one copy of each of the various genes is inherited from each parent.That`s why parents having dark complexion often give Birth to a baby also have a dark skin colour.But mutations in genes may also change the skin colour of baby that`s why in many cases the skin colour of newly born baby sometimes either more fairer or more Darker even than Parents. Some skin disorders also give your skin a dark complexion such as Lichen Simplex Chronicus is a skin disorder that causes severe itching that leaves the skin thick, dark and patchy. Some Vitamins specially Vitamin A, C, E and B-Complex are very important for white glowing and healthy skin but their deficiency may causes dull, rough and dark skin. Deficiency of some essential nutrients also results in dark complexion. This is also one of the main reason of darkening of skin. Sometimes adrenal disorder may also results in dark complexion. Sometimes it also contributes in darkening of skin. Sometimes darkening of skin occurs as a result of a hormonal change. For example hormonal changes during pregnancy or with the use of birth control pills may also result in darkened skin. Over exposure to sun rays causes the skin to tan. This is a natural mechanism of skin to protect itself from the harmful UV rays of the sun, the skin produces more of the pigment melanin which shields the penetration of UV rays into the skin but also give your skin a dark complexion.Although UV radiation can assist in the production of vitamin D but excessive exposure to UV can damage health and convert your skin into dark or brownish black. Application of raw milk is one of the best and simplest home remedy to get fair complexion. Early morning you can wash your face with some raw milk or simple apply some raw milk on your face and leave at least for 15 minutes and then was off with plain water. Another home remedy for fair complexion includes grinding a bunch of mint leaves and applying the paste on your face. This paste has a soothing effect on your skin. Once the paste dries up, you can wash it off with cold water. This can be repeated for fifteen days to have beautiful fair skin. Once the desired results are achieved you may continue using this remedy regularly at least once a week. This is also considered a very effective home remedy for fair complexion. Take a raw papaya(papeeta) and mash the flesh to pulp. Apply the pulp on your face to make your face soft and smooth. Apply this pulp once every week. Instead of raw papaya, you can also use avocado. However with that, every morning wash your face with raw milk to improve your complexion. Apply a mixture of tomato pulp with 2-3 drops of lime juice on the face. Leave it for 20 minutes before washing off. Do this twice a day for 15-20 days for best results. Potato(aloo) acts as a very good bleaching agent. Slice a potato and massage your skin with these slices. Now keep them over the face at least for 20 minutes. This would lighten the marks on skin and help you to get smooth skin. Curd acts as a natural skin cleanser and helps a lot in getting fair skin. If you have normal skin you can apply curd daily. It is considered very effective to get fair complexion. Egg yolk mixed with honey is also considered very helpful to get fair skin. Apply this mask on your face and wash off after 15 minutes or when it completely dries. For best results apply it just twice a week. Make a mixture of sandalwood and Rose water and apply it on your face and neck. As Excessive quantity of Melanin Pigment give your skin dark complexion and its Production increase by heating effects but a daily application of the mixture of sandalwood and Rose water cools your skin as well as brings a fair glow on your face. You can make a paste by mixing 1 tablespoon of cucumber(kheera) pulp with same amount of coconut(nariyal) water. Apply this paste regularly to get a Fair and glowing complexion. Rose Oil is a cooling agent against the production of Melanin pigment and a Natural way to give you a fair and glowing skin.It is a good source of vitamins C and E which are essential for having younger and smooth skin. Rose oil removes dead cells from the skin, and provides relief from burns. It slows the aging process.Rose oil is used for cleansing, toning, moisturizing, and nourishing of the skin. Make a mixture by adding equal amounts of sandalwood power and turmeric(haldi) powder. Add some rose water to make a thick paste. Apply this paste on your skin and let it stay for 15-20 minutes. Finally rinse off with lukewarm water and splash with cold water to close skin pores. Lemon is a natural bleaching agent and can help remove the tan from your face. Lemon contains ascorbic acid due to which it can easily bleach tanned skin. Simply squeeze a lemon into a dish. Soak a cotton ball into the lemon juice and apply it all over your face and neck. Lemon is also considered best to give you glowing skin.Although Lemon is supposed to be a natural bleach but be aware that it dries the face. That`s why apply moisturizer or almond oil after washing off lemon, honey is also considered a natural bleach for your skin. Another effective remedy to remove tan and to get fair complexion would be to soak 4 almonds in water and keep it overnight. Remove their skin.Grind these almonds and make a paste by adding few drops of Rose water. Apply this paste at bedtime. Remain this paste on your face overnight. In the morning, was off this paste with cold water. You can make a pack by mixing together one teaspoon of honey with one tablespoon of lemon juice. Apply this on your face and leave for a few minutes and then wash off. This allows your skin to appear healthy and glowing. This is also a great way to moisturize dry skin and give it soft and smooth appearance. Make a paste by mixing 1 tablespoon of milk powder, one teaspoon of honey and 1/2 teaspoon of lemon juice. You can also add a few drops of almond oil to make the skin appear thoroughly moisturized. Apply this face pack on your face and wash off after 15 minutes. This pack helps in naturally polishing the skin, removing dead skin and also reduces the tanning effect and gives your skin a white glowing look. This face pack is very good for normal skin. Take 1 tablespoon of oatmeal and mix with 1 tablespoon of curd and 1 teaspoon of tomato juice and apply on the face. Keep it on for 20 minutes and then wash it off with cold water. It not only helps remove the tan but also lightens the skin and helps to get fair complexion. A tablespoon of gram flour(besan) mixed with 2 tablespoons of raw milk and 2-3 drops of lime juice works well for lightening dark skin. Apply this mixture and leave it for 15 minutes before washing off. Repeat this on a daily basis at least for 2 weeks. After getting required results try to use it at least once in a week. Use a face mask with a combination of egg white and honey. Leave it on your face for 15 minutes and then remove with a cloth soaked in warm water. Dry some orange peels and grind them to make a fine powder. Now mix 2 tablespoons of dried orange peels powder with 4 tablespoons of curd and equally apply on your face. This would be beneficial in removing tan. Keep this for about 15 minutes and wash off with cold water. Take 1/2 teaspoon of turmeric powder and 1/2 teaspoon of red sandalwood powder. Mix them with 1 teaspoon of milk, 1/2 teaspoon of almond oil, one egg white and few drops of lemon juice. Mix all the ingredients to make a smooth paste and apply it on the face for 15 minutes. For smooth skin and bright complexion use this mask at least twice a week. To get a fair skin, mix 4 tablespoons of gram flour(besan) with enough quantity of egg white to make the mixture having the consistency of a thick paste. To enhance the skin whitening effect of this mask you can also add few drops of lemon juice. Mix all the ingredients and apply this over your face and neck. This face pack can also be applied on your entire body. After 15 minutes slowly wipe off the pack and wash with plain water. Take 2 tablespoons of orange juice, 2 teaspoons of honey and one tablespoon of rose water and mix them with one tablespoon of fuller’s earth. This mix is enough to apply over your clean face and neck. After 15 minutes wipe the pack with a moist towel and wash off with water. This is considered very effective for smooth and white glowing skin. Add half teaspoon of olive oil and half teaspoon of lime juice to one full egg yolk. Mix them well and apply it over your face. Leave it on at least for 15 minutes. After this remove it with damp cloth and finally wash off with lukewarm water. Take one tablespoon of olive oil, one tablespoon of milk and half teaspoon of honey. Mix them well to make a smooth paste and apply this pack on your face for 15 minutes. Wipe off the pack using moist cloth or cotton dipped in lukewarm water. Take 2 tablespoon of curd and one teaspoon of rose water and mix them with two tablespoons of oatmeal. Apply this pack on your face for 15 minutes. Finally wash off with slightly warm water. Take 1 tablespoon of gram flour (besan) and half teaspoon of honey and mix them with 1 teaspoon of cucumber juice to make a smooth paste. Apply this all over the face and neck. After 15 minutes remove it with fresh water. Take 2 tablespoons of tomato pulp and mix with 1 tablespoon of curd. Apply this pack all over your face. If you are not allergic to any of the two ingredients then remain this mixture on your face at least for 15 minutes. Finally wash off with plain water. Soak four almonds overnight. In the morning remove their skin and grind them fine. Make a paste by adding one teaspoon of Gram flour(Besan), one teaspoon of milk and four drops of Lime juice. Apply this on your face for about 15 minutes. A regular application of this mask will bring Natural Fairness on your face. Take One tablespoon of carrot juice, one tablespoon of tomato juice and one tablespoon of lemon juice. Mix them well and apply this mixture on your face for about 20 minutes. This skin whitening face pack is equally well both for oily and dry skin. (ii)Apply a good sun screen lotion before you go out in the sun to protect your skin from the harmful UV rays and sun tanning. (iii)Drink at least 10 to 12 glasses of water to hydrate your skin and keep it blemish free. (iv)Avoid excessive consumption of heavy and oily foods. (v) Try to consume lots of fresh fruits and vegetables containing Vitamin A, B, C and E. All these vitamins are very important to get fair glowing and healthy skin.